Make dinner the biggest meal. By the time your baby is old enough to sleep through the night, he should be eating some solid foods. Make dinner your baby’s heaviest meal, so he goes to bed with a full tummy. Warm oatmeal. Some moms swear by it! The warm and cozy mixture of oats and milk (or water) has some kind of magical tummy filling power that sends babies to a restful sleep. Feed the baby 1-2 hours before bedtime. Feeding your baby a full meal right before laying him down in bed might not be the best idea. Often times their bellies are so full they need to have a bowel movement first. The last thing you want is to find a huge, dirty diaper in the morning, or a baby that wakes himself up from going to the bathroom. Top off dinner with a small bottle. If your baby is still taking bottles, cap off dinner with a small (4-6 oz.) warm bottle of milk right before bed. This might soothe him and help him stay asleep. Add cereal to the midnight bottle. If your baby is waking up in the middle of the night, try adding a tablespoon of cereal to his warm bottle. There are many things you can try that help your baby sleep through the night, but if your child is younger than four months old, we not recommend any. His little body still needs to develop and adjust its internal clock. Remember that there is no magic food that will get your baby to sleep all night long. We know it seems like this period will never end, but we promise you it will. 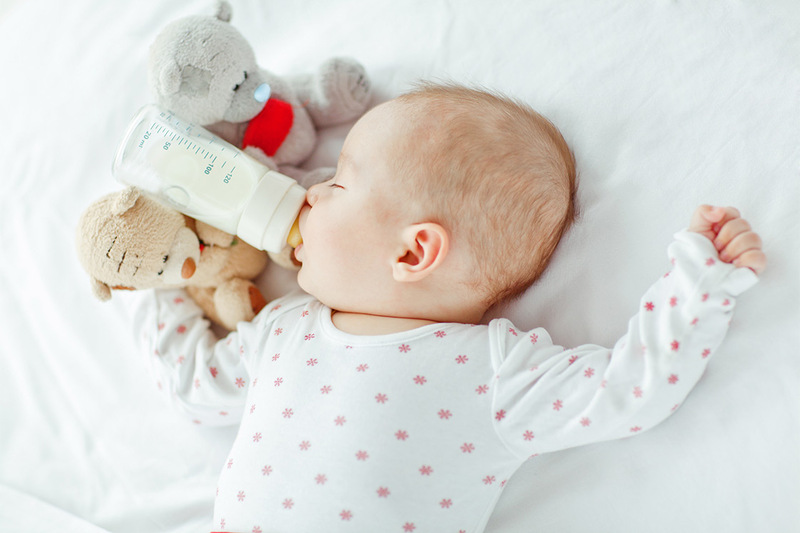 Making sure your baby gets plenty of satisfying food to eat is perhaps the single most important thing you can do to get your baby to sleep through the night.